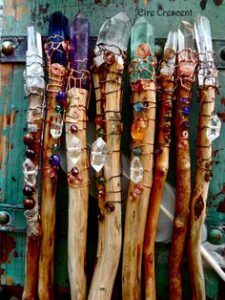 Get your bottle of wine (or not) and head on over to Keene Intuition for an evening with Leona Carney, Magaian Priestess and Brandie Wells, Compassionate Clairvoyant to create your own Wand! Provided: Wooden wand(8-10″), Wire, amazing, high quality beads and other magical elements included. ***Bring your own Crystal for the end of your wand***Some will be for sale for $5-$20 as well. You are welcome to bring your own supplies as well. About Leona Carney: “I am a Magaian Priestess, and have been following the Goddesses path for 27 years. I have formal training in Wicca, Medicine Way studies, Buddhist studies, and lastly currently The Magaian Way. After years of solitary study, I discovered a powerful group of women at Rowe Camp and Conference Center, and am now part of the staff for our yearly Woman Soul Retreat. I believe that we all are sacred, and will continue to be open to all faiths.Through many wonderful and challenging experiences, I have been blessed to cross paths with powerful individuals who have enriched my journey. All along, Spirit has been with me, as She is with us all. I am an artist, an activist, a Priestess, a crafter, a firedancer, and a painter of dreams. I am called to share what I know with others, and hope to bring joy and empowerment to those who Seek as well”. About Brandie Wells: Clairvoyant, Psychic Medium, Animal Communicator, Angel Reader & Healer, Palmistry Teacher, Paranormal and Cold Case Investigator & Event/Party Planner. Brandie believes creating is meditating! “I have been clairvoyant since childhood. I am telepathic, audio clairvoyant and sensitive while I receive messages and images from spirit. Through various skills of divination, I share my compassion and love of humanity. I enjoy making the connection between the human form and the Spirit Realm.